The X16-1D is a hardware update to the X16-1C. Priced at only $89, the X16-1D is a very economical data logger packed with exceptional features. The X16-1D implements a digital 3-axis 16g accelerometer with user selectable sample rates up to 400Hz. This simple device stores precisely timed acceleration data on a microSD flash card. Just plug it into a PC and the X16-1D mounts as a USB Mass Storage Device similar to a USB flash drive. Data is stored in plain text Comma Separated Values (.csv) files, ready to be imported into any spreadsheet, word processor, or end user application. The X16-1D options are set up easily using a simple text based configuration file. The X16-1D operates from a replaceable AA type alkaline battery (ANSI type 15A or IEC type LR6). 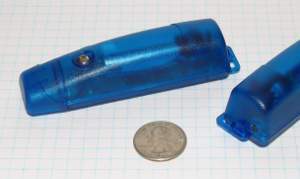 Read more about our data logger product-line features. Operates on an AA type alkaline battery. Extended data logging capability using an external 5v USB power source. Please see the X16-1D user manual (.pdf) for a detailed description of features and operation instructions. The user manual includes an example data file and instructions for converting the data and time stamps. Read more about typical applications.